As The Voice of Business Since 1972, the Navarre Chamber is the perfect vehicle to drive business to your business! 500+ members and a substantial audience of engaged online users, the Navarre Chamber's reach is unmatched by any organization in the Navarre area. The Navarre Chamber offers exclusive advertising and sponsorship opportunities that are targeted and affordable. CLICK HERE for some of the FREE and affordable options to help increase visibility for your business/organization and help spread the word about your product and services. Whether you are a small business owner or the leader of a large regional business interested in targeting almost 40,000 residents of the Navarre community, the Navarre Chamber can provide a cost-effective advertising and sponsorship package that will deliver results and drive more customers to your business. To learn more about our advertising and sponsorship opportunities, contact Chanda Ryan at 850.939.3267. Sponsorship Opportunities and Tickets are still available for . . . 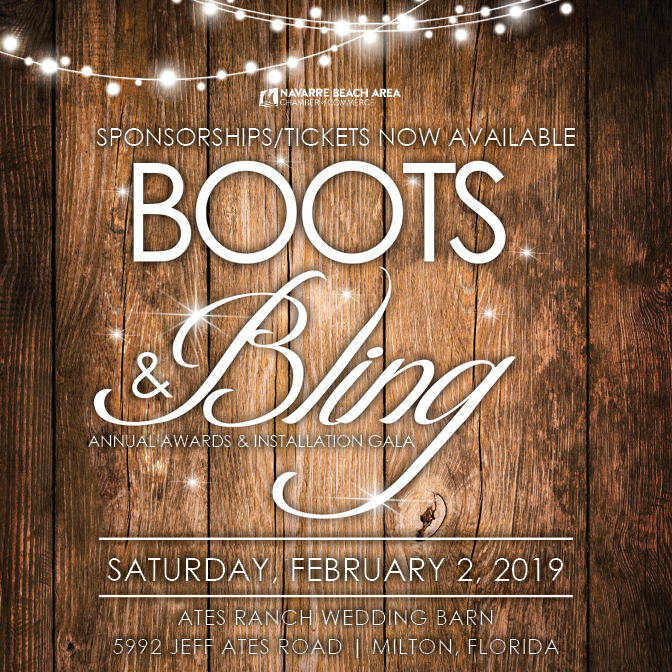 Annual Awards & Installation Gala on Saturday, February 2, 2019. The Navarre area's largest monthly networking event is Commerce & Coffee, the Navarre Chamber's monthly membership breakfast. CLICK HERE for sponsorship opportunities currently available.